What are the most important characteristics of amplifier in messaging systems for escalators and moving walkways? Our clients operate their systems in extremely demanding environments. They tell us that the escalator messaging amplification systems must do two things – deliver crisp, clean, easy to understand messages and be durable. The bottom line in automatic messaging systems is that amplifiers need to deliver the appropriate power and do so constantly day in and day out. If you are considering walkway or escalator modernization, our system can help you deliver automatic messages with the right amount of power. 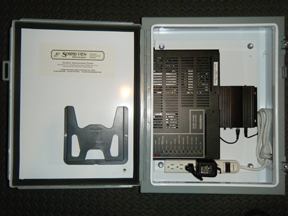 Sound View Electronics’ walkway and escalator messaging amplifiers can drive 6 to 8 to 12 or more speakers to meet your needs. Our walkway and escalator amplifiers are generally found in Subway, Train and Bus Stations, Arenas, Hotels, Amusement Parks, Department Stores, Malls, Casinos and Airports. However, we can place them in any escalator or walkway application. 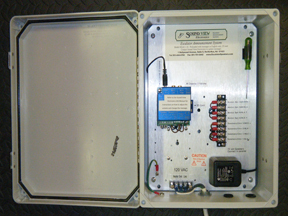 Our amplifiers come in molded fiberglass or 16G steel enclosures, have a gasket seal and are NEMA (National Electrical Manufacturers Association) rated. This allows them to function in the cruelest environments. They are dust, grime, dirt, water and vibration resistant enabling installation in the escalator or walkway motor room or pit – a harsh environment indeed.